Hello !! Have you just typed in looking for a family photographer near me ? and a LOT of family photographers and wedding photographers have popped up. I totally understand, its difficult to choose. When my humans were little i broke my heart trying to find a family photographer near me that would do the type of portrait shoot i wanted. The white studio look wasn’t the look I wanted. I wanted a family photographer near me to come to my home and photograph my family. Mr B and I wanted natural organic pictures, just like the ones i used to take for families many moons ago. However the PRICES…. the prices were astronomical. We used Venture for the first human Hudson, the prices were eye watering and also not what i wanted. But lack of options and energy made me plow ahead. Two more little humans added to the brood and i started looking again. Family Photographer near me, hit a blank wall again. So off to Venture we went. If i thought i was tired after having one little human. Exhaustion with 2 brand new newborns and a 1 year old was unbelievable. The stress of the family photoshoot was unbearable. My Boy 1 had no idea what was going on and cried….. the whole time. Boys 2 & 3, they did what 4 months old do, they slept when i wanted them awake. Pooped when i wanted them to not. Cried along with Boy 1 and Mr B and I left the studio searching for divorce solicitors. We didn’t have the energy to go back to the In Person Sales (IPS) and ended up not even seeing the images or getting them printed…. Its too much to ask new parents to participate in these types of selling practices !! Fast forward a few months and I visited the zoo with my 3 little boys. (Pushing the double buggy up the hills to see the Giraffe was my weekly workout). I threw up all over that zoo, I came home convinced i had caught a bug. Instead I had the surprise of my life. This time i didn’t even have the energy to LOOK for a family photographer near me. I purchased a little digital camera and snapped away constantly hoping to capture moments. They are all stored on the oldest hard drive in the world. Im going to need to power up the oldest lap top in the history of technology to get to them. However that is a summer goal to try and get at those 8000+ images i know are stored in my little black box. It my one material thing id rescue in a fire. I suppose what im trying to say with this BLOG is i feel your pain. I can completely relate to the struggle to choose a photographer thats going capture your family. Not everyone likes the studio photography that Northern Ireland is awash with. Wedding photographers shoot on location and they offer family photography shoots. However their prices match that, expensive. I did find an awesome wedding photographer that photographed families. However once again i had to head to the studio. He was so great with the little kids, but they missed the personality I was longing for. I even brought along buckets of toys to spread around to try and generate the feelings i wanted to capture. The images are SUPERB quality, sharp clean, well lit. But they lack my families personality. I have worked in studio photography for years. It was more a hobby than a bill paying exercise. I just loved working with the families that came to me. Over the last 3 years my business has grown and i feel SO lucky each time i jump in the car heading off to an outdoor family photography shoot. So what im saying is this. If you are looking for a family photographer near me, then phone ME !! 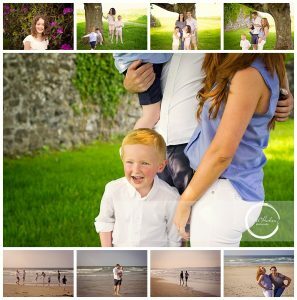 I work all over Northern Ireland capturing families as they are. Natural and organic. Our beautiful parks and beaches are the backdrop to your family photographs. Have a look at my website to see if i suit your style. Check out Facebook or Google to see the reviews. Research research research, is the key to finding exactly what you want. They say a picture captures 1000 words, so check out the images. Do you see something in them that speaks to you. Can i come and capture that for you? I would LOVE to so much meet you and your family. So give me a ring 077033 89313. Im ever so chatty !! Have a look below at a family photoshoot I did at the start of summer. I travelled upto the North Coast, and had THE BEST afternoon with this family. The images will show you how we can capture so many different themes in one afternoon. Have a look at my BLOG to see other family portrait sessions i have done. Antrim Castle Gardens has beautiful grounds we can explore and have fun.